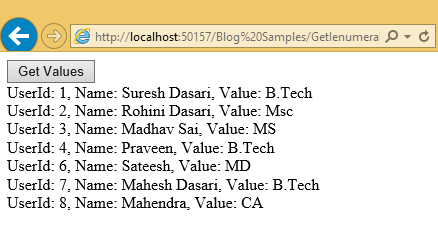 Here I will explain how to convert datatable to IEnumerable list in c#, vb.net using as.npet. IEnumerable list is a base for all collections and its having ability to loop through the collection by using current property, MoveNext and Reset methods in c#, vb.net. <asp:Button ID="btnGetValues" Text="Get Values" runat="server"
lblval.Text += "UserId: " + row.UserId + ", Name: " + row.UserName + ", Value: " + row.Education + "<br/>"